Boyds, Md. and Washington, D.C. (Jan, 30, 2019) – The Washington Spirit, Monumental Sports Network and NBC Sports Washington have finalized a groundbreaking broadcast partnership which will provide local TV and digital broadcasts of a minimum of 12 Spirit games during the 2019 National Women’s Soccer League (NWSL) season. 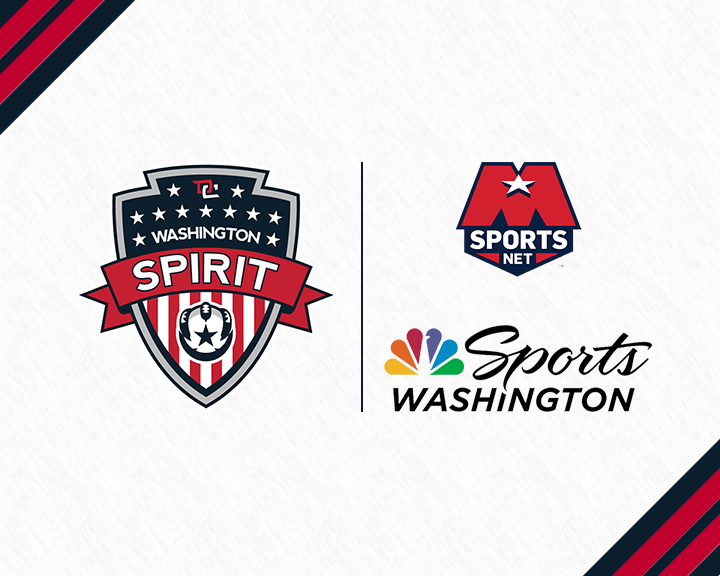 In addition, the Spirit will participate in cross-promotional activities with Monumental Sports Network and NBC Sports Washington, providing fans with a new level of access to the Spirit through original content on and off the field. Fans throughout the Mid-Atlantic region will have the opportunity to view Spirit games on Monumental Sports Network and NBC Sports Washington as women’s soccer takes center stage in 2019, a year highlighted by this summer’s FIFA Women’s World Cup in France. Expected World Cup-bound players, including U.S. Women’s National Team rising stars Mallory Pugh and Rose Lavelle, will represent the Spirit this season as they compete in the world’s top women’s professional soccer league. NWSL players helped 13 countries qualify for the 2019 Women’s World Cup, and the overwhelming majority of the current U.S. Women’s National Team player pool is represented across the NWSL’s nine clubs. The NWSL is home to many of the biggest names in women’s soccer, including Marta, Alex Morgan, Carli Lloyd, Christen Press and Tobin Heath, among many others. Spirit games will be shown live on Monumental Sports Network and NBC Sports Washington in both the lead-up to, and in the aftermath of the Women’s World Cup. With the new landmark broadcast partnership, fans will see an unprecedented level of women’s soccer coverage across the Monumental Sports Network and NBC Sports Washington platforms. The Washington Spirit were represented during negotiations by Drew Mills, President of Mills Marketing and Communications Inc. based in Rockville Maryland. Subscribers of Monumental Sports Network will now have access to live Spirit games in addition to Washington Mystics, Capital City Go-Go, Washington Valor, Baltimore Brigade, collegiate and high school games as well as 52 weeks of exclusive shows, on-demand access to Capitals and Wizards games aired on NBC Sports Washington, and VIP events and ticket opportunities. Fans can visit getmonumental.com for more information. A full broadcast schedule for the 2019 season will be unveiled in the coming weeks, following the release of the NWSL regular season schedule. The Washington Spirit is the professional women’s soccer team based at the Maryland SoccerPlex in Germantown, Md. Launched in 2012, the Spirit play in the National Women’s Soccer League, the premier women’s soccer competition in North America. For more information about the Spirit, visit www.WashingtonSpirit.com, follow the club on Twitter @WashSpirit and on Facebook at facebook.com/washingtonspirit. Monumental Sports Network presented by Ticketmaster is the mid-Atlantic region’s top destination for exclusive fan experiences and original sports content across desktop, tablet, mobile and OTT streaming devices. Monumental Sports Network is owned and operated by Monumental Sports & Entertainment (MSE) and by NBC Sports Group. Monumental Sports Network serves as a digital platform for fans and customers in the D.C. region and around the world. MSE – Monumental Sports Network’s parent company – is one of the largest integrated sports and entertainment companies in the country with one of the most diverse partnership groups in all of sports. NBC Sports Washington, part of NBC Sports Group, is the official sports network of the NHL’s Washington Capitals, NBA’s Washington Wizards, NFL’s Washington Redskins and ACC. NBC Sports Washington – the leading multiplatform sports media organization serving the District of Columbia, Maryland and Virginia – delivers more than 400 live events per year, along with Emmy Award-winning news, analysis and entertainment programming. NBC Sports Washington’s digital portfolio is the region’s top source for written, video and interactive sports content. Follow the network on Twitter via @NBCSWashington, and on NBCSportsWashington.com and the MyTeams app. The National Women’s Soccer League (NWSL) is a nine-team Division-I women’s professional soccer league featuring players from around the world. The nine clubs are the Chicago Red Stars, Houston Dash, North Carolina Courage, Orlando Pride, Portland Thorns FC, Seattle Reign FC, Sky Blue FC, Utah Royals FC and Washington Spirit. Based in Chicago, the NWSL is supported by the United States Soccer Federation and the Canadian Soccer Association. For more information about the NWSL, log on to the league’s official website at www.NWSLsoccer.com.